With my own beloved “dad’s army” team entering the final stages of dementia, having forgotten how to defend, how to attack and more poignantly, how to win. They finally lost all semblance of sanity, during a sundowner taxi ride in Barcelona. Indeed, I am reminded of the pronouncement of Private Frazer that “We’re Doomed” and the words of the inimitable Del Boy; it really has all gone ‘Chateauneuf du Pape! But, then I guess, c’est la vie! The health of a Club is more than the absence of disease, it’s a dynamic condition resulting from its ability to constantly adjust and change to the stresses and strains in its environment, and those club’s and individuals that embrace this notion will survive and thrive, those that do not, will inevitably struggle. With this in mind, my attention has been turned to other possible ailments afflicting Premier league Clubs. First, and by no means least on my injury list is Arsenal, the “Gooners” a once mighty, invincible team, reduced to a labouring gigantic monolith of a Club, with one almighty girth, a waist size now so ginormous the terraces of the Emirates are beginning to moan and groan under the increasing pressure. It has become a Team resting on its laurels, with a bulging bank balance and heading towards a state of manifest metabolic crisis, otherwise known as type 2 diabetes. With such adiposity at their disposal you’d expect the manager to see fit and spend a little of that fat on team improvements, with the aim of shifting some of the deadweight and replacing it with stronger, more resilient muscle. Mais non, the Manager and Chairman have preferred to take a more circumspect approach with team health, oblivious to the long-term consequences of such an inflamed situation at the stadium and the soul of the Club, they have instead sought to preserve the bellyfat reserves and thereby undermine future prosperity. Now, I have been an admirer of Arsene for a long time, I have held him up as a paragon for the importance of a Manager retaining control in order to get the most out of the team and players. Except, I draw a thick red line through dictatorial management, especially when that control ends up taking the team in the wrong direction and both performances and the enjoyment of the fans begin to suffer. He may be revered as “Le Professeur” with a masters degree in Economics, but unfortunately that intellect is so invested in balancing the books and persevering with a footballing philosophy, which the majority of fans can clearly see isn’t working, it is highly doubtful Wenger is the man to return Arsenal back to health again. The same old predictable tactics, using the wings, passing the ball around, making sure every attack goes through the midfield playmaker, with little emphasis on defensive play, just doesn’t get the desired results anymore. It reminds me a lot of the middle aged individual, with the middle age spread, following the same eating patterns or adhering to the same dietary guidelines that has seen them gradually expand into extra large easyfit trousers! Perhaps, the time has now come to start questioning some of those intransigent beliefs that stops the Club from progressing forward and allows, indeed, passively accepts, a chronic deterioration in form and health? which translates as: “Everyone sees noon at his doorstep.” Originating from a time when people had sundials outside their front doors to tell the time, its underlying truth is that every individual is preoccupied with their own personal interests in life, and have their own unique version of the truth. Which means, the person who does not move forward, recedes. There can be no standstill in life, only evolution or devolution and often both involve revolution, something the French have a particular penchant for. The French Revolution was a watershed moment, widely regarded as one of the most important events in modern history. It ultimately led to a fundamental transformation in how people looked at themselves, and how they began to see the world, a new perspective, a paradigm shift towards an egalitarian society, full of new and exciting ideas. If only Arsenal and modern health care services could be resurrected in such a way. So, the idea I want to discuss is not what players you need to bring to your team, because that is a matter of personal opinion and conjecture, but what changes or revolution needs to take place at your Club, to improve its health and how well it plays. And, as always, the starting point should be its, raison d’etre, its purpose and goal in life. I would suggest that after the last 10 years and more of Wenger saying his goal is to make the top 4 and get into Europe, the fans are getting a tad weary of the same old, same old, diatribe. Where is the ambition, the excitement, the joie de vivre, from always doing what you’ve always done and always getting what you’ve already got? It’s not going to inspire the team to win the coveted prize of the Champions League and it’s certainly not going to help you back to health and playing well again. Perhaps, also after 40 years or so of an equally intransigent management of dietary guidelines, telling us to eat less, move more, and reduce saturated fats, which has produced equally p**s poor results, we also need to start demanding a revolution in the way we manage our own health, and the obesity and type 2 diabetes epidemics in particular. Because, just like those Arsenal fans having to wait so long for the problems at their club to be fixed, when they can all blatantly see where the problem lies; defensive fragility and a lack of leadership on the pitch. I’m equally exasperated that my patients have had to wait so long to “fix” their obesity or type 2 diabetes or at the very least be pointed in the right direction, when again the solutions are so relatively simple; reduce the insulin resistance and blood sugar levels with dietary and lifestyle interventions like; relaxation, restorative sleep, exercise and a “real” food diet, with an emphasis on carbohydrate reduction. Alas, the focus of healthcare systems has been on treating the symptoms rather than tackling root causes. Consequently, the spotlight has been well and truly on bringing down high blood sugars, cholesterol and blood pressure, creating a culture in which there’s a pill for every ill, with a reliance on drugs to counteract a symptom becoming the accepted norm. Whereas, any manager worthy of premier league status would at least attempt to identify the root cause of the problem and then correct it, either with a change in tactics, improved training or player recruitment. I don’t think our raison d’etre should ever be to just control symptoms and maintain the bank balances of the food and pharmaceutical companies whose shareholders have a vested interest in maintaining the current status quo. Just as I don’t think it’s acceptable for a Club like Arsenal to ignore the obvious and protect shareholders investments, at the expense of performances on the pitch. Each and everyone of us needs to take an active role in the management of our own “Clubs” and start addressing the root causes of poor play that lead to chronic diseases, before performances deteriorate and relegation becomes a reality. Meaning “It is better to prevent than to heal,” it is better to take the necessary precautions to prevent a sickness, than to have to treat the sickness. It is sens commun, it’s just common sense. If your team keeps letting in goals because of a defensive weakness at left back, you need to identify that as the root cause of the problem and attempt to change tactics or strengthen in that position. Likewise, if the sugars in your blood are too high (Prediabetic or diabetic) because of a combination of the foods you eat and insulin resistance, then the sensible option is to change dietary tactics and reduce insulin resistance. You wouldn’t carry on with the same tactics and spend money on strikers and expect long term improvements in results and health, when the problem is in defence! So, why would it be acceptable to spend large amounts of money on drugs (strikers) to correct a lifestyle problem like type 2 diabetes? Je ne comprends pas! (I don’t understand). Because, just like every football team, we all have our own strengths and weaknesses which demand unique solutions, which makes prescriptive management, both ineffective and very expensive. The Arsenal fans have been misled and misdirected about the resources needed for the building of the Emirates, with the result that the Club has simply got fatter and fatter, and performances on the pitch have got weaker and increasingly meaningless. In a similar way, people with obesity and type 2 diabetes have been mismanaged and misinformed about what they need to eat and the lifestyle changes they need to make to address the root cause of their problems. Worse still, that advice, to eat a balanced diet has in many cases actually made things worse, with the result that they often end up taking more and more medications which do nothing to counteract the problem. So, we end up with a modern society in which 40% of adults are obese and nearly 50% are either prediabetic or type 2 already, and the biggest winners are the pharmaceutical and food companies who increase their profits and effectively finance the guidelines. The idealistic, passionate and scientific, Arsène Wenger may have led the modernisation of English football and overseen a very successful Arsenal team, but that time and those tactics have now been and gone. Similarly, as the NHS, enters its 70th year, the vision of Aneurin Bevan; a health service free at the point of delivery for all, needs updating to account for changes in the modern game. If we cling to the mind set that all the answers are to be found in medicalising and medicating, then the health service will remain in a relegation dogfight as the burden of chronic diseases continues unabated and the only people benefiting are the fat cats and shareholders. This will require a different kind of investment, different tactics, a new purpose, a complete rethink of education, self-analysis, the willingness of the individual to find out what works for them, rather than blindly following guidelines. 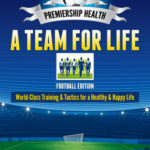 Every football team is different, just as every individual is different and therefore different tactics and training regimes are required to promote Premiership Health. No longer can we allow corporate profits to come before team performances and fan satisfaction. No longer should we have to spend all our wealth to regain health, no longer can we ignore the importance of prevention and a strong defence to remain healthy. 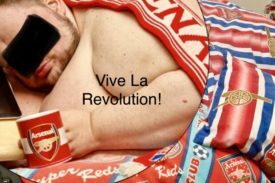 Maybe this is the revolution we need, because standing still and doing more of the same is not an option, it’s now up to the individual to take back control of their own teams in life and make managerial decisions and changes to their lifestyle, which will improve the health of the Club and allow them to start playing well again. Vive la difference! Vive la revolucion! ← NHS – Relegation Dogfight!